I am so very sorry guys! Life has just been crazy busy the last MONTH (!) and the blog has suffered as a result. That is not to say that I haven’t been writing, because I have! I just haven’t posted any of it. I have a few race recaps almost ready to go, just need to type them up and add pictures as they are currently handwritten. What has been going on with me? I’m sure you’re curious. Haha. So, let me do my best to get you all caught up on the last month of my life and all the happenings. When I was handwriting this post, I wasn’t sure of the date of my last post, but after logging onto my blog today, I discovered it’s been almost an entire month. Eek! Like 3 Thursdays ago, I had gone for a run in the spirit of multitasking, I threw my laundry in the washer with plans to toss it in the dryer when I was done with my so that it would be finished by the time I went to work. Well, I got home from my run to find that my washer was still full of water and was refusing to drain or spin cycle. Great. I thought I remembered someone had once told me that so long as the lid stayed shut it would be fine. So I left it as it was and went to work. After my regular shift that night, I was making my way to my overtime assignment. I was in the left lane and there was a car in the lane to my right. All of a sudden he signaled and cut me off. I had no time to react to avoid colliding with him. Thankfully, 1) he pulled over, 2) he had insurance, and 3) both him and his passenger were really nice. So, that was a fantastic day…not. At least my car was drivable. However I couldn’t open the passenger door and if I went over a bump my finder would rub on my tire. That night, I made my claim with insurance and scheduled my estimate for the following Monday. 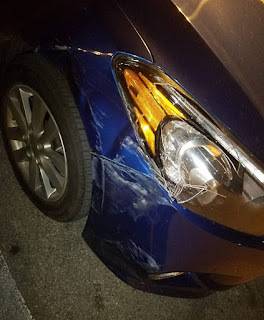 I arrived Monday and they went ahead and kept my car, siting that there could be damage to the suspension system making it very unsafe to drive. Not sure if that was BS or not, but whatever. I went to Enterprise and got my rental. A 2016 Chevy Impala. If you own this make, model and year, I apologize, but I absolutely hated it. HATED it. Seriously, the only things I liked about it were the giant trunk and that the power plugs stayed on when the car was turned off. Not kidding, I totally hated it. Okay, back pedal to that Saturday. Bootcamp. We did something called “wall walks.” If you’re a crossfitter, then you’re already familiar with them. If not, here’s the low down. You start in the pushup position with your feet against the wall. You lift your feet up and place them on the wall (this is called an inverted plank, in case you were wondering). Then you walk your hands toward the wall and your feet slide up the wall until you’re doing a handstand against the wall. You touch your nose to the wall and then walk your hands back out until you’re back in the pushup position. I am in love with them. I thought about them the entire week following our first doing them and was VERY happy when the following Saturday they were part of our workout again! I even tried to do one at work, but it didn’t work out, sadly…because my work boots had no grip to the sole so I couldn’t get my feet to stay up against the wall in the inverted plank position. I’ll have to figure out a way to do them at home. I don’t have any free wall space, but maybe I can use my front door? Maybe not, I don’t think the ceiling in my entry way is tall enough. I might be able to close my bedroom door and do them there, the ceiling in there is way taller. Or, I can go to the fitness room in my apts. Options…I have them…maybe. Haha. 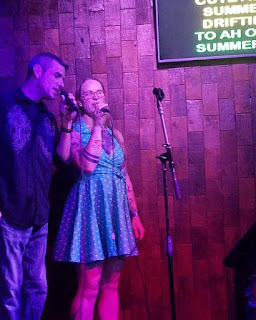 Karaoke last Sunday went quite well with the exception of one song that I totally bombed. One of the regulars, a guy named Casey, told me that he loved my voice. YAY! then, another guy had me sing with him, but I didn’t know it until the KJ called him up on stage…with me to assist! It was Summer Lovin’ from Grease. I sang 3 new-to-me songs so I’m happy with that. My car was originally schedule to be complete last Friday afternoon, but Tuesday I woke up to a text from the body shop that my car was ready! OMG! 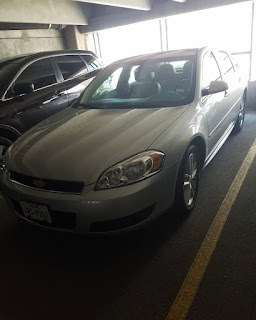 So I happily dropped off the hated rental only to be told that if I wasn’t happy I could have come in at any time and they would have swapped me out for a car I liked better. Well wouldn’t that have been nice to know. the to go get my car. They washed her and did a basic detail on the interior. They replaced the front bumper, right front fender, wheel, tire, some brackets and supports, heat light and some other things. She looks beautiful again! I was so happy to have her back that I literally cried as I was driving away from the body shop. I’m all over the place here. Thursday before last, I had a great 4 mile run. Completed 4 miles in under 39 minutes. Not bad for someone that hadn’t run in 8 days! (of course, right now, it’s been over 1.5 weeks since I ran…ugh)I was going to run or hit the gym last Sunday, but that didn’t happen. Then I was going to run last Monday but was so tired that I slept straight thru my alarms! 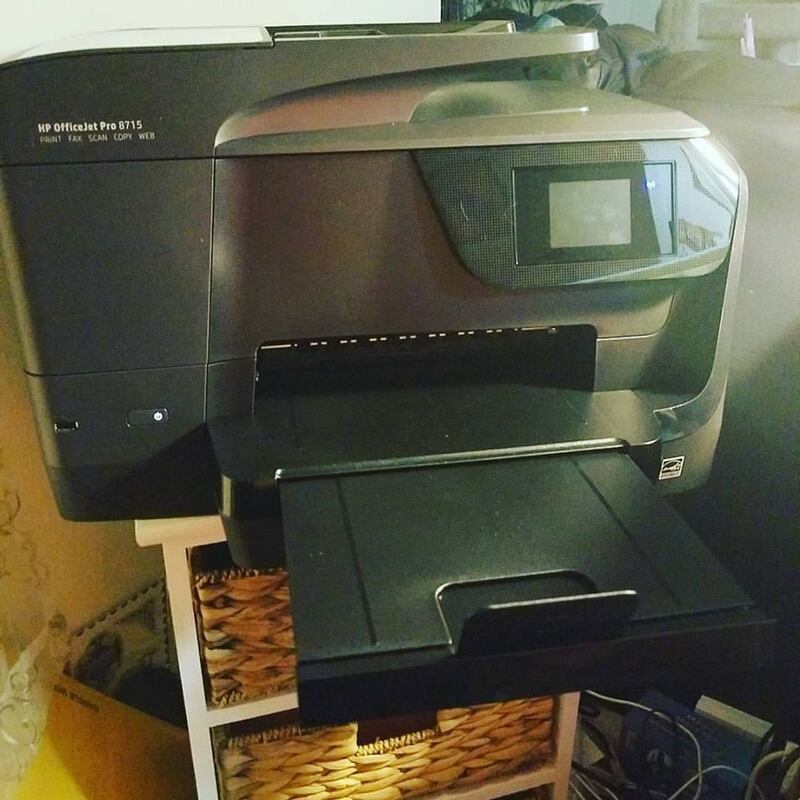 Last weekend, I went ahead and bought a new printer. It’s not the one I was originally looking at, but it’s its little brother…basically. It is missing some features that the other one has, but they are nothing that I need. Also it prints just 2-4 pages slower per minute. Whoop-de-do. Big deal. It was $65 less, so I went ahead and got it. I love it but am still figuring it out, of course. In fact this past weekend I had my first paper jam because I didn’t realize I needed to change the paper type when using photo paper instead of regular paper because I didn’t have to do that with the Canon. OH! So this new printer is an HP something 8710 (but the box says 8715…who knows). Anyway, I love it. I might have found someone to be an occasional running buddy! We’ll see how our schedules work out. I decided that after my road trip, that I will 1) go ahead and buy a new washing machine and 2) sign up for the Gold’s Studio package so I can do the Gold’s Fit classes. I just have to decide if I want to do 1 or 2 classes per week (4 or 8 classes a month). I’ll have to look up the pricing and then decide. I’d love to do twice a week, but really, it just depends on the price. I bought more dresses…surprise, surprise. But, I only took a picture of 1 of them. 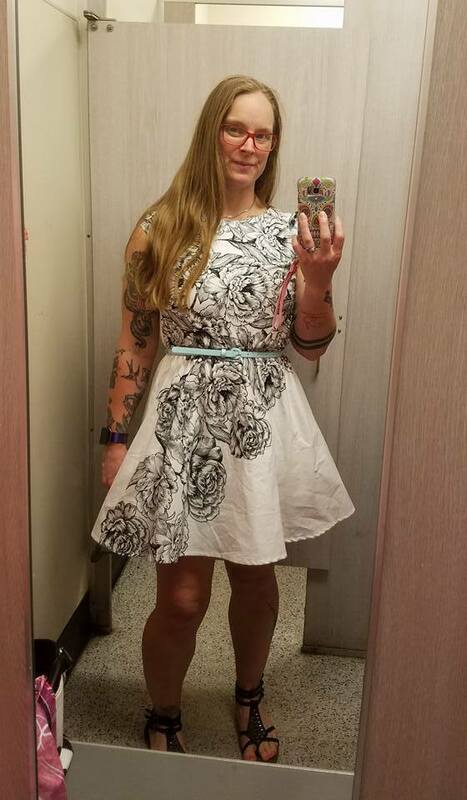 It's white with sketch-style roses is my absolute favorite.